Texas 77002, has applied for a Title XI guarantee to aid in financing the construc- tion of four drill barges. Red Fox Indus- tries, New Iberia, La., is the proposed builder. The inland bay and shallow coastal waters drilling barges are intended to be operated on the United States Gulf Coast. Litton Industries' Ingalls Shipbuilding Di- vision was commissioned into active U.S.
Navy service in Pascagoula, Miss., recently. The 7,800-ton, 563-foot-long Harry W.
Hill (DD-986), under command of Comdr. J.J. Hogan of Manchester, N.H., joined 11 other ships of the class now operating with the Pacific Fleet based in San Diego, Calif.
Mexico, during recent sea trials. 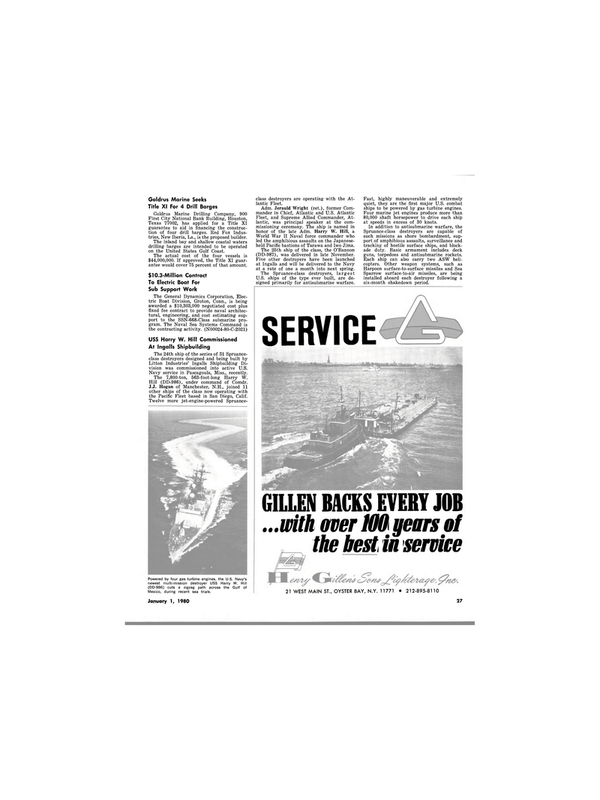 January 1, 1980 class destroyers are operating with the At- lantic Fleet. World War II Naval force commander who led the amphibious assaults on the Japanese- held Pacific bastions of Tarawa and Iwo Jima. The 25th ship of the class, the O'Bannon (DD-987), was delivered in late November. Five other destroyers have been launched at Ingalls and will be delivered to the Navy at a rate of one a month into next spring. U.S. ships of the type ever built, are de- signed primarily for antisubmarine warfare. Fast, highly maneuverable and extremely quiet, they are the first major U.S. combat ships to be powered by gas turbine engines. Four marine jet engines produce more than 80,000 shaft horsepower to drive each ship at speeds in excess of 30 knots. Spruance-class destroyers are capable of such missions as shore bombardment, sup- port of amphibious assaults, surveillance and tracking of hostile surface ships, and block- ade duty. Basic armament includes deck guns, torpedoes and antisubmarine rockets. Sparrow surface-to-air missiles, are being installed aboard each destroyer following a six-month shakedown period.